Republican presidential candidate Donald Trump speaks during a campaign rally at High Point University, in High Point, North Carolina, Sept. 20, 2016. U.S. presidential candidates Donald Trump and Hillary Clinton are clashing over which one could improve the plight of low-income residents in the country's inner cities. "We're going to rebuild our inner cities because our African-American communities are absolutely in the worst shape they've ever been in before. Ever, ever, ever,” Trump, the Republican contender, told a rally late Tuesday in North Carolina, the mid-Atlantic battleground election state that is crucial to both candidates. “You take a look at the inner cities, you get no education, you get no jobs, you get shot walking down the street. They're worse, I mean honestly, places like Afghanistan are safer than some of our inner cities,” said Trump, a brash real estate tycoon seeking his first elected office. Trump's assessment of the state of life in the nation's poverty-ridden cities as the worst ever drew attacks from critics on social media who said his sweeping comments ignored the country's history of slavery through the mid-1800s and government-mandated racial segregation in parts of the country that was not overturned until the 1960s. 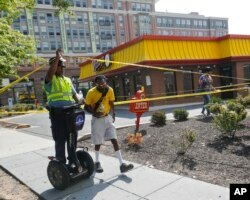 A Washington Metro Police officer raises police tape for a pedestrian to walk under following a shooting at 3800 block Georgia Ave., N.W., in the Petworth neighborhood of Washington, Sept. 7, 2016. National political surveys show the Clinton, the Democratic candidate and a former U.S. secretary of state, with a wide edge among black voters over Trump. But he said that major cities for years have been run by Democratic politicians and that the party's presidential candidates tell inner-city residents "they want your vote and they say, 'See ya in four years.' Hillary Clinton is an example of it." "I say to the African-American community, 'What do you have to lose?' I'm going to fix it," Trump said. He appeared Wednesday at a black church in Cleveland, Ohio, a Democratic stronghold in a key Midwestern state where both candidates are trying to gain an edge seven weeks before the November 8 election. Clinton, in an opinion article in The New York Times about poverty in America, vowed that if she is elected "one of my top priorities will be increasing economic growth that’s strong, fair and lasting. I will work with Democrats and Republicans to make a historic investment in good-paying jobs -- jobs in infrastructure and manufacturing, technology and innovation, small businesses and clean energy." She added, "We also need to ensure that our investments are reaching the communities suffering the most from decades of neglect. We have got to acknowledge that even though poverty overall has fallen, extreme poverty has increased." U.S. Democratic presidential candidate Hillary Clinton waves as she boards her campaign plane at the Westchester County airport in White Plains, New York, Sept. 21, 2016. 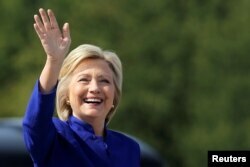 Clinton, looking to become the country's first female president, said she favors an anti-poverty strategy that calls for directing 10 percent of federal investments to communities where 20 percent of the residents have been living in poverty for 30 years. "And we’ll put special emphasis on minority communities that have been held back for too long by barriers of systemic racism," she said. Clinton said Trump "doesn’t seem to spend much time worrying about people in poverty. In fact, his economic plans would overwhelmingly benefit the wealthiest Americans, and would include an estimated $4 billion tax cut for his own family just by eliminating the estate tax. He has actually said that wages are too high." Trump, a one-time television reality show host, and Clinton, the wife of former President Bill Clinton, are locked in a tight contest to become the country's 45th president, replacing President Barack Obama when he leaves office in January. Clinton held a commanding 8-percentage-point advantage over Trump in early August, but Trump has virtually erased that edge. The RealClearPolitics' average of national polls calculates her lead at 1.1 percent, while The New York Times says it is a bit larger at 44-42 percent. The candidates are squaring off face to face next Monday in the first of their three scheduled presidential debates.